Team DirtFirst Racer Andy Lagzdins made it two wins in a row to start off the 2012 National Hare and Hound season with a win at the 62nd Annual Moose Run put on by the Four Aces MC at the Spangler Hills OHV area in Ridgecrest, California. The mild temperatures and dry weather made for a enjoyable but dusty event, with the course consisting of long whoop trails punctuated with rocky sections. Lagzdins took the holeshot on his Duncan-powered Honda TRX450R at the start of the 47-mile course ahead of rookie NHHA racer Keith Carlson, with Yamaha rider Chris Dobbins in third. Within five miles Carlson had made his way past Lagzdins and into the lead on his Suzuki LTR450. A battle ensued between the two riders for the next 20 miles, with Andy trying desperately to get back in front and out of the dust. “I was just blazing my own line through the desert next to Keith’s dust cloud,” said Lagzdins after the race. “I never thought that a quad could blow through bushes and cactus like that, but I wanted to get back up front so bad I pushed it to the limit.” A flat tire on the rear of Carlson’s quad would slow him enough to allow Lagzdins to motor past and take the win, but the fast young rider held off the rest of the field to finish in second place. “My race was going great until about 30 miles in, then I got a flat tire,” said Carlson after the race. While running in the third spot, Dobbins crashed hard and broke the subframe on his Raptor 700. “I was about a minute behind Keith when I had a big crash that destroyed my subframe near mile marker 35, and then I bent a tie rod just short of check #3,” said Dobbins. After a bad start, Teixeira Tech’s Bill Markel worked his way up through the pack to finish third for the day. “I had a good start then Andy started coming over into my lane and instead of challenging him I let him have the lead. Wrong choice- he dusted me out so bad I fell back to about 5th or 6th. I passed a couple quads back by the bomb. I ended up 3rd overall quad today,” said Markel after the race. Both Lagzdins and Carlson will be racing in Mexico at the Score International San Felipe 250 on March 9th; Andy with Craig Christy’s Class 25 team, and Keith with Nick Nelson’s Class 24 team. 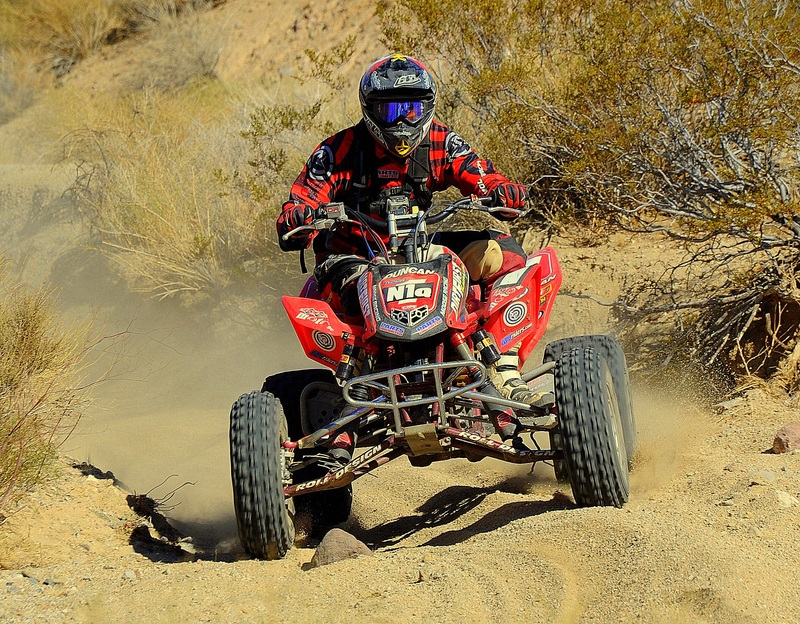 The next round of the NHHA Series will be the Vikings MC event, which will take place at the Johnson Valley OHV area on April 22nd. Great post! That was a fun race! Yall are AWSOME. Looking forward to the San Felipe 250. Hope to read some live posts of race on Facebook. Will be looking. LUCK TO EVERYONE AND TO THE NEW KID. GO ,GO ,GO oh yeah did I say GO !!!!!!!!!!!!!!!!!!!!!!!!!!!!! !